Werkt met elke Windows-compatibele geluidskaart. 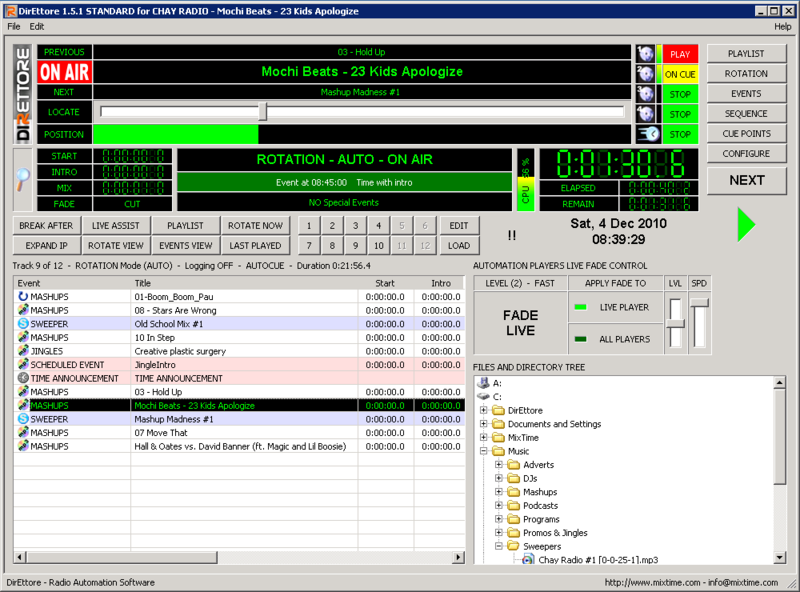 Werkt met de meest voorkomende audioformaten: MP3, WAV, MP2, OGG, WMA, FLAC, AAC +. ZaraStudio is een applicatie die is ontworpen om radiostations te automatiseren, en voor achtergrond muziek in supermarkten. Willekeurige muziekstijlen, fades en automatische overlappingen tussen nummers op basis van het geluidsniveau, DTMF-tonen detectie zonder extra hardware, afstandsbediening via de parallelle poort, een compleet evenementen systeem, vier aux-spelers en kan werken met maximaal zes geluidskaarten tegelijkertijd. Door deze functies is het een zeer populaire programma voor vele stations over de hele wereld. 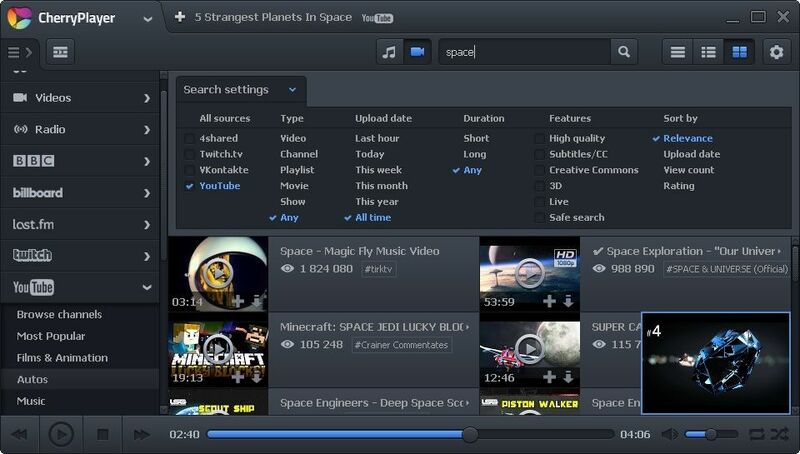 CherryPlayer is a unique multimedia player that combines all the benefits and advantages of a desktop player and the ability to play almost all types of streaming multimedia, such as video, audio, radio, and live broadcasts. Built-in categorized playlists from YouTube allow to be aware of everything that happens in the world of entertainment, sports, movies and more. With the ability to login to user's channel Cherryplayer becomes a real YouTube player. For gamers there is an opportunity to search and view streams on Twitch.tv with an ability to login to account there. Music fans will find support of SHOUTcast, SoundCloud and VK services. All this with the minimal usage of system resources, built-in codecs, intuitive interface and many other advantages makes CherryPlayer truly unsurpassed by convenience and functionality multimedia player. Tired of reaching for your volume knob every time your mp3 player changes to a new song? 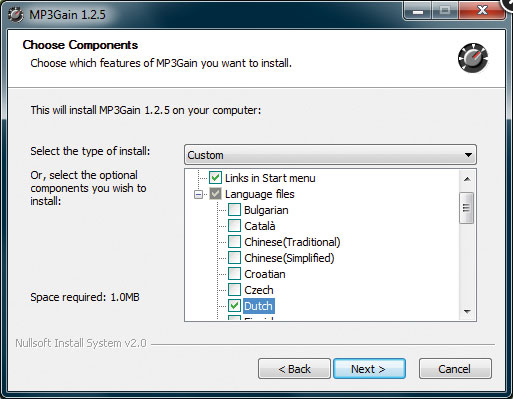 MP3Gain - A free automatic mp3 volume normalizer. Funny Voice is a great and fun tool for recording your voice and changing it into funny ways. It is very user friendly and easy to use. You can sound like a chipmunk, an alien or a robot. The pitch of the voice can be changed according to your liking; a higher pitch may end up making you sound like a smurf, while a lower pitch may give you a deeper voice. Every funny voice effect can be modified; a variety of sounds can be manipulated at different speeds and pitches for hours of fun. It can change soulless sounds into funny audio notes and give you hours of fun and entertainment. A microphone is all you require to make use of this application. So, instead of making use of your microphone, plug in the output sound of the audio system and listen to your funny voice. It will be an amazing tool for your next karaoke party and it is also a great application that you can use for your answering machines. 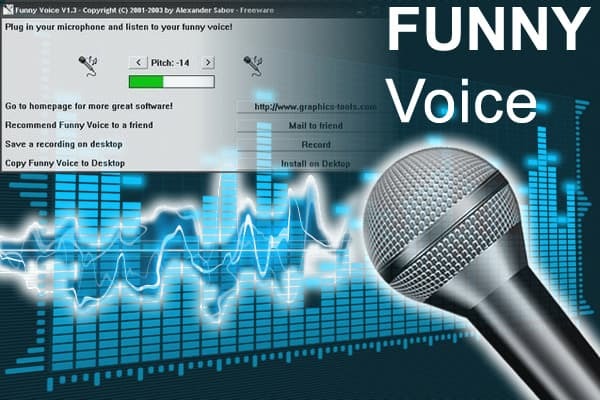 Funny voice is free to use and it is even more appreciated because it is a small sized application that does not require to be fully installed.